1. The Making of an Evangelist. England was a vile cesspool of drunkenness, gambling, prostitution, etc. London was so filled with bars, William Hogarth’s cartoon “Gin Lane” in the lower left depicted a sign over a bar that said, “Drunk for a Penny, Dead drunk for two pence, Clean Straw for Nothing.” The Church of England was dead as a doornail; Puritan churches were a dead form, partly due to the economic prosperity released by their hard work ethic; and the clergy: ungodly hypocrites and Pharisaic externalists. From out of the tavern culture, God found a young lad named George Whitefield, born December 16, 1714. His dad died when he was young; and his mother managed the bar his father started in the Bell Inn, Gloucester:–where he also lived with 6 siblings. He was sent to school; and at the age of 12, developed an impressive vocabulary. In his teens, George became a waiter at the bar, when a friend came one day, and told him about his experiences as a “sizar” at Oxford University. A sizar was a poor student who earned his way through college by being a servant to other students. George and his mother figured this was what he should do for his advancement; with a little bit of financial aid from his mother’s network of family and friends, off he went to Oxford. 2. The Holy Club–London, Georgia. John and Charles Wesley, the sons of an Anglican priest, had a campus ministry at Oxford called “the Holy Club,” which was committed to producing saints through the practice of spiritual disciplines such as fasting, prayer, Bible study, and giving to the poor. George joined this group through being invited by Charles. God must have been drawing him by the Spirit for him to have agreed with this. As George put into practice the great “methods” as they were called, for which they were ridiculed as “Methodists,” he pushed himself to the point of exhaustion and sickness. At which time, having observed he was overdoing it, Charles gave him a book by Henry Scougal called The Life of God in the Soul of Man. This book contained the Gospel message that George would adopt, and preach throughout England and America, spreading the Evangelical Revival known as the Great Awakening. After having been crushed by the law of God, George knew he was missing something…GRACE! He could identify with the Romans 7 struggle, but now he came to understand he needed the new birth and justification by faith in Jesus, spoken of in Romans 3, 4, and 8. As he studied Scougal and the New Testament, he journaled, “God showed me that true religion is union of the soul with God and Christ proved within us. A ray of Divine light was instantaneously darted in upon my soul and I knew I must be a new creature.” This conversion from the Wesleys’ Anglican works-justification occurred in 1736, two years before John Wesley’s “Aldersgate Experience” conversion on May 24th, 1738. Soon afterwards, George was ordained an Anglican priest, and began preaching sermons on the new birth (regeneration) and justification by faith. The poor common people were very attracted to his preaching and they would crowd the Anglican churches, much to the embarrassment of the carnal priests. George took collections during his sermons to give to the poor. Gradually, Whitefield started open-air preaching to the crowds as well, because they would stay and listen. Georgia was on his mind; his friends the Wesleys were asking him to come over to do missionary work with them. But every time he tried, there was some closed door with the ships, and he wouldn’t be able to get over there. So, he used his time open-air preaching in England, causing Evangelical revivals everywhere. When the Wesleys returned, depressed at their failure in Georgia, they told George not to go. But he went anyway, and spread the Great Awakening in Georgia through his Gospel message, and his own new birth:–which the Wesleys had not yet experienced. 3. America–The Revival Begins–God’s Open Air. Upon arriving in Savannah, Georgia, he gathered large crowds. His message was rare, powerful, and full of the Holy Ghost, and his preaching style was eloquent and fiery. George saw many orphaned children being taken advantage of by wicked businessmen; they were being abused in child labor. So, he succeeded in raising funds for the founding of an orphanage there. He returned on ship back home to England, but was blown off course and landed in Ireland. So, George took to the streets and gathered massive crowds again; revivals were everywhere! Eventually he made it to London, and there found that by now the Wesleys had experienced the same new birth through justification by faith (John Wesley’s came from hearing a reading of Martin Luther’s Preface to his Commentary on Romans, and felt the Holy Spirit burning in his heart! ); so now they were preaching the same Gospel:–this was in 1738. But the Anglican priests had barred the Wesleys and Whitefield from their pulpits. They were sick of their “enthusiastic” fanaticism:–their charismatic belief in the witness of the Spirit by the new birth (Romans 8:16). It was a gift the priests did not possess; and so, it caused them no small embarrassment, and probably a bit of jealousy. Belden says that Whitefield was ordained an Anglican priest on January 14, 1739 (p. 15). (Was this a second ordination? He also says he was ordained on page 10–assuming that was in 1736. Hmm.) Either way, Whitefield’s ordination in 1739 was given to him reluctantly and regrettably by Bishop Butler–a Pharisaic Anglican priest. Whitefield found all of the Anglican churches closed to him, even though masses of common people swarmed to hear him preach. So, this turned Whitefield into an open-air preacher for good. 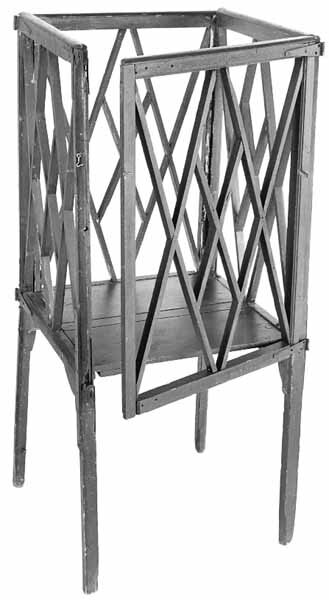 He even made himself a portable, folding pulpit just for open-air preaching. And sometimes when a crowd would get too rowdy–he would fold up his pulpit and escape. It was more like a little stool with a gate around it. He would preach with it at the fairgrounds to clowns and freaks. He attained such notoriety, that even the rich and politically influential came to hear him, having something in common with Billy Graham here. There was one occasion when he preached to the elite at the mansion of Selina Hastings, the Countess of Huntingdon. David Hume, the popular agnostic philosopher, was even moved so much to come and hear Whitefield, that he walked 20 miles to hear him! Whitefield’s notoriety and influence made him into an 18th century apostle. At a crucial turning point, he seems to have broken fellowship with the Wesleys, because they became Arminians; whereas Whitefield came to identify more with the Westminster Confession and Calvinistic views of predestination. While the Wesleys were forming the Methodist Episcopal Church, Whitefield founded 47 independent congregationalist churches known as the “Calvinistic Methodists,” funded largely by the Countess. 4. America’s Debt to George Whitefield. So much of his preaching was in England and the surrounding United Kingdom, part of which was the American colonies. 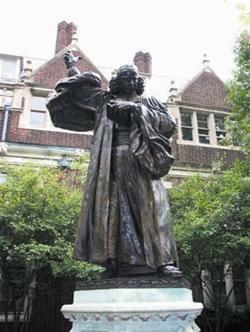 Committed to theological education in the promotion of preachers of the Gospel in the revivalist style, Whitefield raised funds and helped to found 51 colleges in America, the most prominent of which are Princeton and Pennsylvania University–which has a statue of Whitefield by Tait Mackenzie. After the Boston fire of 1760, Whitefield helped to re-stock the library of Harvard. Like Hume, Benjamin Franklin was another elite skeptic who so appreciated Whitefield’s zeal for good works, that he funded the publication of all his books. 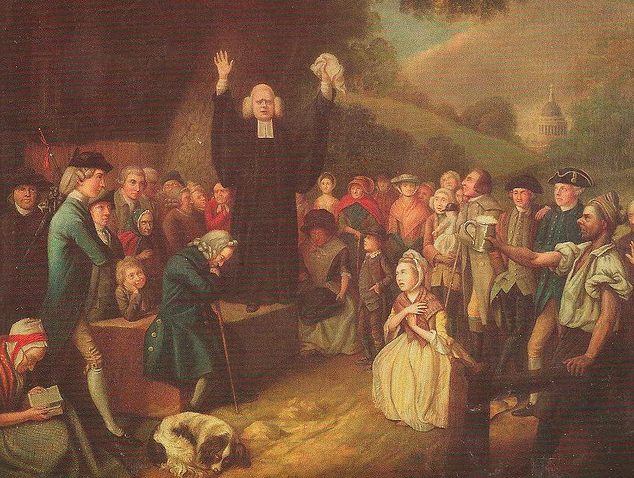 In both England and America, Whitefield’s preaching brought about societal change; and revived faith and holiness in the Anglican, Methodist, Baptist, and Presbyterian churches. One black spot remains on Whitefield’s record: his advocacy of slavery. With most of the churchmen of his day, he believed that a responsible and godly treatment of slaves was in agreement with Abraham’s ownership of slaves, etc. John Wesley, an abolitionist, preached against slavery and also against the American Revolution. Whitefield, on the other hand, believed in “godly slavery” and was supportive of the Revolution. Belden concludes, “Whitefield blazed the trail of revival in America as well as England. First into religious journalism; first into revivalist preachings; first into open-air evangelism; first into a new Christian philosophy and first effectively into the opening-up of the American colonies to the new evangelism and to a new movement towards Christian education” (p. 20). What Belden doesn’t say is that Whitefield died on September 30, 1770–and John Wesley preached his funeral, at Whitefield’s request. This entry was posted in Uncategorized and tagged America, Charles Wesley, England, George Whitefield, John Wesley. Bookmark the permalink.